Lock in a great price for Salmon Landings - rated 9.8 by recent guests. Spectacular location. Wonderfully friendly hosts, nice to have cake and tea on arrival. 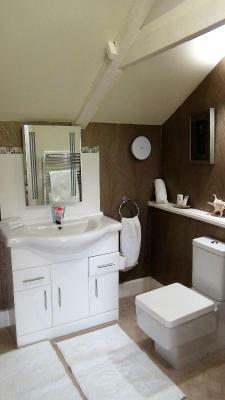 Lovely large bedroom with bath and shower. We pre-booked the evening meal, which was excellent. Breakfast was taken in the lovely conservatory with stunning views of the coastline. There was an excellent selection of items for breakfast. Excellent value for money and we would love to return. Everything. Absolutely wonderful stay with great hosts Julie and Kevan who could not have done anything more to improve our experience. I loved the location, the views, the room and ensuite, the luxurious bedding, the tea cups, the silverware, the table setting, the tea and cake served on arrival, the delicious and ample breakfast, the wonderful style of this remodelled barn/home....and how welcoming Julie and Kevan were. Thank you for your wonderful hospitality. Breakfast, hospitality and an achingly beautiful land/seascape! What is not to like. Gorgeous view, actually spectacular. Breakfast was a five star experience! Kevin and Julie were so nice to visit with. The house is beautifully decorated and very interesting. Views. Breakfast. Comfy beds. Large rooms. Large residents lounge area. Large garden. Just like a home. Hospitality excellent, location breathtaking, lovely house lots of character and history. Beautiful stay. Salmon Landings offers accommodation that is not suitable for children and is located on the North Coast of Scotland, 1.2 miles from Strathy Point Lighthouse, offering views of the North Sea. 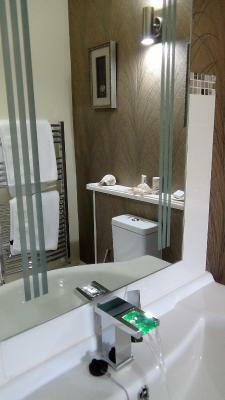 The rooms feature a king size bed and en-suite facilities. There is a flat-screen TV, tea/coffee making facilities, a hairdryer and USB power points. Guests have use of a shared lounge with a wood-burning stove, a flat-screen TV and DVD player. Salmon Landings serves a breakfast menu including porridge, fruit, cereals, a cooked Scottish Breakfast or a continental option available. The property uses locally sourced produce, including sausages, bacon, smoked haddock and free range eggs. The area is popular for walking, golf, horse riding, windsurfing and wildlife-watching. Inverness Airport is 110 miles from the property. The beach at Strathy Bay is 2 miles from Salmon Landings, while the town of Thurso is 22.5 miles away. This property also has one of the best-rated locations in Strathy Point! Guests are happier about it compared to other properties in the area. This property is also rated for the best value in Strathy Point! Guests are getting more for their money when compared to other properties in this city. Salmon Landings has been welcoming Booking.com guests since 23 Jun 2017. When would you like to stay at Salmon Landings? This room is situated on the ground floor, overlooking the surrounding countryside. It has a super-king size bed and an en-suite walk-in shower with complimentary toiletries. The room features free WiFi, a flat-screen smart TV, tea/coffee making facilities, a hairdryer, a USB power point, duck/goose feather and down duvet and pillows. This room is situated on the first floor, overlooking the surrounding countryside and sea in the distance, with a possible view of the Northern Lights in the winter months. It has a super-king size bed and an en-suite bath with shower over. Complimentary toiletries are provided. This room is situated on the first floor, overlooking the surrounding countryside. It has a super-king size bed and an en-suite bath with shower over. Complimentary toiletries are provided. This individually designed room is situated on the ground floor, overlooking the surrounding countryside. It has a twin beds and an en-suite walk-in shower with complimentary toiletries. House rules Salmon Landings takes special requests - add in the next step! Booking.com takes your payment on behalf of the property for this reservation. During your stay you can pay for any extras using Visa, ​Euro/Mastercard, ​Diners Club, ​JCB, ​Maestro and Discover . Please note children cannot be accommodated at the property. Please note the property is in a rural location. Please inform Salmon Landings in advance of your expected arrival time. You can use the Special Requests box when booking, or contact the property directly with the contact details provided in your confirmation. This was a very unique, tastefully decorative, so warm and comfortable B+B or rather “a home away from home.” That’s how welcoming and enjoyable our stay was at Salmon Landings! This is a true gem and the hosts for this property were more than accommodating! Their attention to detail is beyond all expectations. The only down side . . . we couldn’t stay longer! The amenities in the town were fair, but to be expected given its remoteness. In the helpful guide to getting here, as well as mentioning 1.5 miles from the road, it is worth saying it is just after the side road to the west. The surrounding villages are a bit spartan. Not much in the way of food choices. A fantastic haven in a bleak wintry landsacape. Unassuming from the outside but lovingly put together inside. A real home from home and definitely worth a visit. Cosy and friendly, perfect breakfast.